The arrival of the new BMW M4 Convertible (fuel consumption combined: 9.1–8.7 l/100 km [31–32.5 mpg imp]; CO2 emissions combined: 213– 203 g/km) sees BMW M GmbH making another alluring addition to its legendary high-performance sports car line-up. The new M4 Convertible replicates the performance figures of the new BMW M3 Sedan (fuel consumption urban/extra-urban/combined: 8.8–8.3 l/100 km [32.1– 34.0 mpg imp]; CO2 emissions combined: 204–194 g/km) and the new BMW M4 Coupe (fuel consumption urban/extra-urban/combined: 8.8–8.3 l/100 km [32.1–34.0 mpg imp]; CO2 emissions combined: 204–194 g/km), but emphasises its stylish and distinctive appearance through its individual character and places the fascination of sporty and dynamic open-top driving at centre stage. The new model finds BMW M GmbH drawing inspiration from a long tradition: BMW’s high-performance sports car for track and road is entering its fifth generation in open-top form with this new chapter in its history headed “M4 Convertible”. The BMW M4 Convertible shares the elegant lines of its open-top 4 Series siblings. Its design language allows it to skilfully blend a distinctive and graceful silhouette boasting finely balanced proportions when the roof is open with an exceptionally dynamic coupe line, shorn of B-pillars, with the hardtop closed. 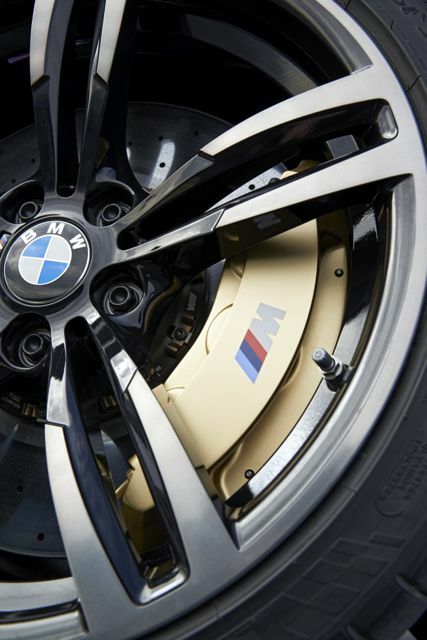 At the same time, the M4 Convertible’s styling cues – including a signature power dome for the bonnet, eye-catching exterior mirrors in twin- stalk style and flared front and rear wheel arches bulging over forged light- alloy wheels with mixed tyres (available in 18 or 19-inch design) – all identify it clearly as a member of the BMW M3/M4 model family. Powering the BMW M4 Convertible is the newly developed six-cylinder in-line engine with M TwinPower Turbo technology and high-revving character already familiar from the M3 Sedan and the M4 Coupe. The power unit generates maximum output of 317 kW/431 hp from its 3.0-litre displacement and serves up peak torque of 550 Newton metres (406 lb-ft) across a wide rev band. The BMW M4 Convertible therefore offers the driver not only exceptionally sporty performance attributes – the sprint from 0 to 100 km/h (62 mph) takes just 4.4 seconds (with the optional seven speed M Double Clutch Transmission) – but also sufficient reserves of power to cruise along in relaxed but rapid style with the roof down. 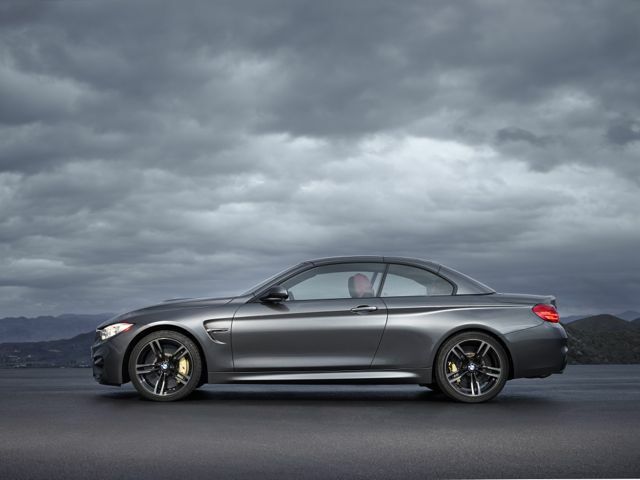 Like the BMW M3 Sedan and BMW M4 Coupe, the BMW M4 Convertible also displays a strict adherence to the intelligent lightweight construction principle. For example, the bonnet and front side panels are made from aluminium, as are many components of the high-performance chassis. Added to which, ultra-lightweight and – thanks to its hugely impressive rigidity – also extremely durable carbon-fibre-reinforced plastic (CFRP) is employed in many areas of the new M4 Convertible. The drive shaft is one example, the use of CFRP allowing it to be constructed as a single-piece unit. This makes for a significant weight saving and a reduction in rotating masses. The CFRP high- precision front strut brace in the engine compartment, meanwhile, weighs only 1.5 kilograms yet offers rigidity superior to that of a comparable aluminium component. It therefore plays a key part in the car’s excellent steering response and precision. BMW M4 Convertible can also be ordered with a wealth of attractive options to further enhance its aesthetic appeal, dynamic prowess and comfort levels. And for that distinctive personal touch, the exclusive BMW Individual range of equipment offers the prospect of a unique driving experience. Special colours and materials can be fine-tuned to the driver’s wishes. For the latest information about US specifications, including fuel efficiency, equipment, and pricing, please visit www.bmwusanews.com.